18/03/2012 INTERNATIONAL SPECIAL SHOW OF RAGUSA 1°ECC - CAC - CACIB - BOS Italian Champion!! 07/2011 4 INTERNATIONAL SHOW OF SPLIT (Hr) 2011 4 times 1°EXC Croatian Junior Champion!! 06/2011 INTERNATIONAL SHOW OF NITRA (SK) 2011 1°ECC - CACJ -JUNIOR BOB - rJ.BOG Slovakia Junior Winner!! 06/2011 INTERNATIONAL SHOW OF NITRA (SK) 2011 1°ECC -CACJ- JUNIOR BOB Slovakia Derby Winner!! 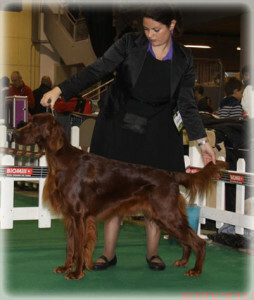 05/2011 INTERNATIONAL SHOW OF MADRID (E) 2011 1°ECC - CACJ - JUNIOR BOB - JBOG Spanish Junior Champion!! 05/2011 INTERNATIONAL SHOW OF MADRID (E) 2011 1°ECC - CACJ - JUNIOR BOB - JBOG Spanish Junior Winner! !